Good news! Motif Investing supports Roth IRA accounts! Check them out here. Hardeep Walia, a former Microsoft Executive who founded Motif Investing, created the platform to help investors gain more control over what they can invest in. Motif offers a theme-based approach for investors to pick an idea to invest in. They also aim to not only give more control to investors but to do so in a low-cost way. For those who want to want to invest in the stock market but don’t have a lot of capital, this platform is a good place to start. Motif Investing is a bit of a hybrid service. It gives you control like an online brokerage for investors who like to DIY, but it’s also part robo-advisor. That means you can have as much control as you want, from picking your own individual stocks, or picking from a premade theme, called a motif. These themes are different industries or a group of different stocks that have one idea in common. If you choose the DIY route, you can select up to 30 stocks or ETFs based on an area of focus and purchase shares in that theme. You also have the option to purchase single stocks or ETFs to add onto an existing motif. You may not get an entire share depending on how much you invest, but owning fractional shares is better than none. For those who choose to go the pre-made route, there are 150 motifs to choose from. Simply pick one from their interface once you log into your account. From there, you can browse different industries and sectors to see what is currently available. Examples of motifs include “World of Sports” or “Battling Cancer”. You can even check ones that have done well over a certain period of time. Motif can also help you choose an asset allocation that is customized your risk tolerance and time horizon with the introduction of their new Horizon models. Motif Investing also introduced Motif Blue, a monthly subscription service that helps investors by automating rebalancing and investing and providing market commentary as well as commission-free trades. -Large social network: This can help you make more educated decisions and even earn royalties if someone purchases a motif you created. There is no account minimum, though you’ll need at least $300 to start investing in a motif. To trade on margin, you will need a minimum of $2,000. Keep in mind there you cannot do margin trading with IRAs. There are no commissions, just flat fees with Motif. You get charged $9.95 every time you purchase a motif and $4.95 if you add any additional stocks or ETFs to an existing motif. If you choose to go with the Motif Blue subscription service, plans start at $4.95 per month to automatically invest and rebalance one motif, up to $19.95 a month to manage unlimited motifs. There are some fees if you do certain types of transfers. If you want to close and/or transfer out your IRA or Roth IRA, you will have to pay $95. If you only want to transfer some of the funds out, it will cost you $65 only if there is a minimum of $100 left in your Motif Investing account. In addition, wiring money from Motif Investing will cost you $25. If you want a broker to help you with your trading, you’ll be charged $45 per trade. Opening an account is easy. All you need to do is fill out your personal details, your SSN and pick the type of account you want to open (you have the option to open other types later). Afterward, you are then asked to fund your account. The approval process differs depending on which method you choose to fund your account. All investing is done in real-time. It really is as simple as that. From there, you can explore existing motifs, trade individual stocks, or build your own motif. Once you’ve decided what you want to purchase, simply click on the blue button on the respective pages to purchase. Trades are then made in real-time. To create your own motif, simply click on “build” and search the stocks you want at the bottom of the screen and check the ones you want off the list. Name your motif and when you’re ready, simply click “create motif”. Within this platform, you can also set up alerts, add motifs onto a watchlist and learn about the latest news from their blog. Motif Investing helps customers connect with each other by giving them the opportunity to publically share the motifs they created. Users can add friends and follow others from the trading community. You can even create a persona Investing Circle to share information on your motifs as well. The idea of this social network is to help the trading community within Motif Investing to learn and gather ideas from each other, share their experiences, ask questions and even discuss the latest trends and news. This is also the place where you or other investor can check out the Creator Royalty Program. This program lets investors to create their own motifs from scratch and share it with others. If someone purchases a motif you created, you can earn $1 each time someone does so. Motif differs from other investing platforms out there, and time will tell how well it’ll do. For now, you can dip your ties in and would probably be beneficial to those who are looking to build an a secondary portfolio or for those who may not want to pay a lot in brokerage fees. Either way, the fees are some of the lowest out there, so it doesn’t hurt to give it a try. The main benefit of Motif Investing is that you can invest in up to 30 stocks simultaneously by purchasing a "motif", for a low price of $9.95. Buying each of these 30 stocks separately would cost over $200 in trade commissions at other discount brokerages! Great online interface and informative Motif is also an easy way to invest because it’s online. The user interface is pretty straightforward, and you don’t have to understand the complexities of investments to make an informed decision – the information about each motif readily available. Finally, the price is right – especially if you buy in bulk. Perfect for those who want to diversify Motif Investing is a great resource for investors wanting exposure to certain niche markets. The low commission costs and $300 minimum investment requirement make it the perfect place to supplement your portfolio with secondary investments in hard to find niches. Motif is also great if you’re looking for substantial diversification but don’t have a lot of money to spend. The Horizon Motifs offer an easy way for new and inexperienced investors to get started by simply choosing their risk tolerance and time horizon. More choices and easy to choose Motif Investing is a great platform for investors that don't want to spend hours choosing stocks for their portfolio, but want more choices than robo advisors currently offer. The cost is cheap and the value is there. We rate it 4.7 stars. It is particularly good for beginners and intermediate investors. Fees are reasonable Motif Investing is an interesting way to invest with a reasonable pricing. But it's definitely not for everyone. While some people are in love with an idea, others find it complicated. There is only one way to find out for sure how you would feel - try it yourself. Account could be opened with $0 down. If you decide it's not for you - there are no account closing fees to worry about (for non-IRA accounts). Lower cost for more extensive investing If you are an investor looking to benefit from broader themes through exposure to multiple stocks and ETFs, Motif Investing offers a way of doing this at a lower cost. Whether you are a beginner, experienced investor, or even a financial advisor, this platform is worth checking out. However if you want to invest in mutual funds, options, or individual stocks, use a traditional online broker. 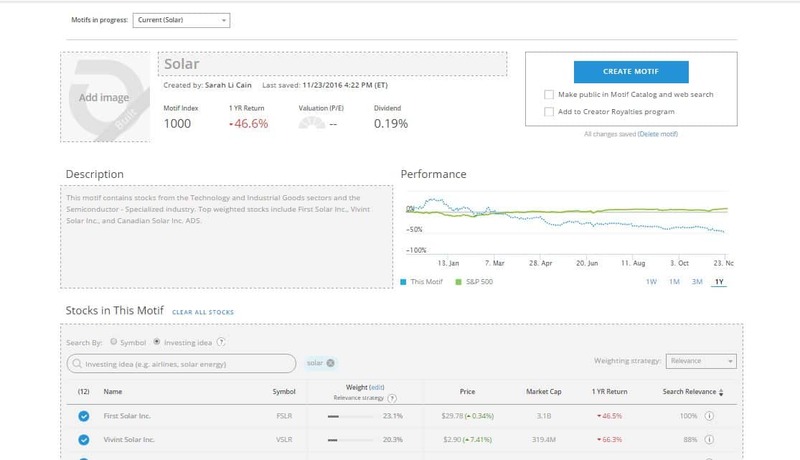 Better than competitors Motif Investing offers select ETF portfolios for free, and allows complete customization of 30 stocks or ETFs for less than $10. An excellent value when compared to competitors. Competitive and tax efficient pricing Theme based investing, Motif Investing is a unique and cost-efficient option for diversifying your portfolio. Their pricing is very competitive, and tax efficient, even if you don't trade stocks.